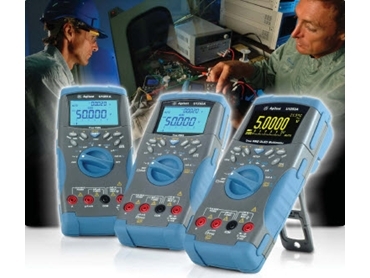 Now available from Agilent Technologies , U1250 Series handheld digital multimeters exceed everyday expectations by delivering powerful features and performance that meets even the toughest requirements and applications. The basic model, the U1251A handheld digital multimeter, expands capabilities beyond typical measurements for this instrument to include data logging. The U1252A digital multimeter has the same foundation as the U1251A, and has an added 20-MHz frequency counter and programmable square-wave generator. Both of these models are supplied with a complete set of accessories to equip the user right from the start at no extra cost. Offering the same functionality as the U1252A, the U1253A is an OLED handheld digital multimeter. It provides crystal clear viewing indoors, in the dark, and in off angle situations. Thanks to their data logging capabilities, these U1250 Series digital multimeters record every reading manually or at intervals specified by the user. And, better still, users can have virtually unlimited data logging when connected to a PC with the optional IR-to-USB cable. Furthermore, U1250 Series digital multimeters allow users greater confidence in their measurements with accurate true-RMS AC measurements, low DCV error rate of up to 0.025% and a high resolution display of 50,000 counts. Housed in robust overmould enclosures, the U1250 Series handheld digital multimeters operate over a wide temperature range of –20 °C to +55 °C.